As yet another year draws to a close I would like to thank you once again for being a guest of Sage Hill Inn & Spa. 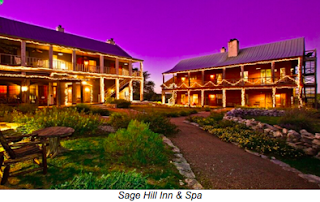 Sage Hill Inn has expanded over the years, always trying to take our property up to the next level to offer a unique experience to our guest. This year we have touched up all the small details in many of our rooms, expanded our gardens and orchard, given a few rescue bees a new home and received some heritage Cotton Patch geese to do our part to preserve this bit of Americana. In addtion, the Inn continues to recieve countless awards, including this year from TripAdvisor, Select Registry, Vogue and many other publications. We do know that we couldn’t do what we do without each and every single guest that we get the pleasure of caring for while you are here. I can speak for each employee here when I say that we have the best guests and are lucky to be able to work here to serve you. We hope to see each of your faces again here soon.